This combined PDB / OSD is great for user that enjoy a simple setup away from a PC. 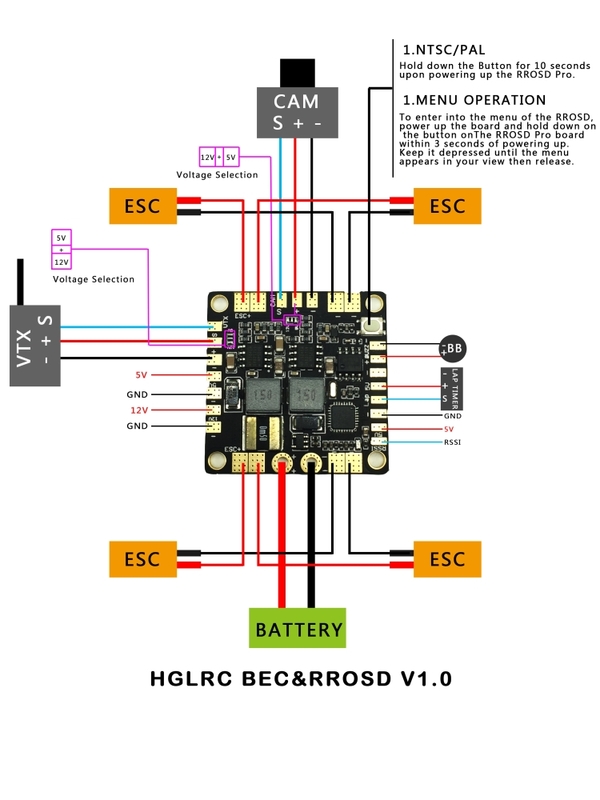 The board incorporates all of the features you expect of a good quality PDB and pairs it with a straightforward OSD (On-Screen-Display) that doesn't require setup in CleanFlight or a connection with a flight controller. The OSD can be used to show battery voltage, current draw, current consumption, RSSI, flight time. It's configured and calibrated all via a simple onboard push button. The board features easy solder pads for your ESCs power connections and it's rated up to 140amps. There are also voltage-regulated connections providing 5 and 12 volts. The 5V BEC connection is ideal for powering your flight controller or RC receiver, while the 12V output could be used to power FPV components or lighting. The PDB incorporates a power filter that uses an inductor and capacitor to remove noise, feeding a clean power supply to your FPV gear. This is important as if your FPV electronics share the same power source as the motors, you can get interference, seen as moving lines in your video feed. The board also has dedicated connections for powering a FPV camera and a FPV video transmitter (VTX), with solder jumpers that let you select their output voltage (5/12v). So you can use a 5v camera with a 12v VTX, or a 12v camera with a 12v VTX. The board is a standard 36mm sized PDB, so you can stack it cleanly with regular racing drone flight controllers. Change Video Mode(NTSC/PAL): Hold down the Button for 10 seconds upon powering up the RROSD Pro. The LED will flash 5 times to indicate that the Video mode has been successfully changed. To enter into the menu of the OSD, power up the board and hold down on the button on The OSD Pro board within 3 seconds of powering up. Keep it depressed until the menu appears in your view then release. To navigate through the menu single click the button to move down an option. Long press to select an option. RSSI Calibration: To calibrate your RSSI reading, select the high reading with your radio and receiver powered on and nearby. Flip off the radio and select the low reading to calibrate the bottom signal range. *The reading you will see on the OSD is the true received strength of the signal (more accurate and different from a 2 way telemetry signal being sent from a receiver). Voltage Calibration: This menu item lets you calibrate your voltage reading by entering your own offset. Current Calibration: This menu item lets you calibrate your Current reading offset from -20% to +20%. Set mAH Alarm: Allows you to set mAh consumption alarm. This will cause the respective indicator to blink on screen when the desired value is reached. We recommend setting mAH to 80% of the battery capacity. Enable Background Shade: Allows you to enable or disable the darkened bar behind the OSD text for better readability.